The Vela pulsar, a neutron star that was formed when a massive star collapsed. The new video of the spinning Vela pulsar was recorded by the Chandra X-ray Observatory shows a new look at the ultra-dense star, which is just 12 miles (19 kilometers) wide and located about 1,000 light-years from Earth. It spews out a jet of charged particles along its rotation axis as it spins. "We think the Vela pulsar is like a rotating garden sprinkler — except with the water blasting out at over half the speed of light," researcher Martin Durant, of the University of Toronto in Canada, said in a statement. Pulsars get their name because they appear to pulse on and off as beams of light sweep across Earth and then away. The Vela pulsar is a compact neutron star, a star that has collapsed so much that it is composed only of neutrons. The Vela pulsar's jets look strikingly like a rotating helix and appear similar to those produced by accreting supermassive black holes in other galaxies. But since the pulsar's jet is smaller, more quickly changing and closer to Earth by comparison, it can be studied in much great detail than jets from black holes. The pulsar's jets are also long, stretching out across about 0.7 light-years. One light-year is the distance light travels in a single year, about 6 trillion miles (10 trillion km). The new observations from the Chandra observatory (which were obtained between June and September 2010) suggest the Vela pulsar may be slowly wobbling as it whirls around, Chandra scientists said. It is possible that the neutron star is no longer a perfect sphere, causing the wobble, they added. Such wobbling by a star is known as its precession, and researchers said it could be caused when the Vela pulsar's fast spin is compounded by intermittent boosts of increased speed. "The deviation from a perfect sphere may only be equivalent to about one part in 100 million," said George Washington University researcher Oleg Kargaltsev. "Neutron stars are so dense that even a tiny distortion like this would have a big effect." 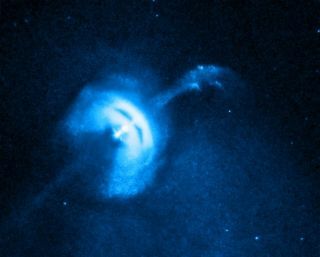 If the distorted shape theory is confirmed, the Vela pulsar would be the first neutron star ever seen with such a feature, researchers said. Another idea suggests that the magnetic field of the Vela pulsar, not its shape, may be the true culprit behind the strange shape of the super-fast jets. The research was presented last week at the American Astronomical Society meeting in Long Beach, Calif., and detailed in The Astrophysical Journal. The new Vela pulsar study marked the second time astronomers have created a movie of the object's strange jets using the Chandra observatory. A similar movie was recorded in 2003, but was based on shorter observations that did not reveal the pulsar's odd precession motion, researchers said.